I would give you the shirt off my back but my gym has rules against that. It doesn't matter anyway because you have a chance to win a free shirt here instead! I've had this serious urge to design and so little time to do it. If I had my way I would be designing a whole lot more than I am now. My head is constantly swimming with ideas most of which I really can't make heads or tails of because there's so much I need to sift through to get to the good stuff. That being said, I managed to eek out a few "new" designs this round, but if you take a peek at the Zaps Threads Store you'll notice a couple new designs that I added a while back that will also be part of the free shirt giveaway. In fact, any design I've done so far is up for grabs on a shirt so come get some! WHAT YOU GET: The winner gets a FREE Zaps Thread Tee ($25 value) with the design of your choice printed on it. HOW YOU GONNA GET IT: Please do the following to be officially entered in the giveaway. STEP 2: Post a comment to my blog here so that I know you want a free shirt! HOW YOU GONNA WIN IT: You gotta be lucky, my friend. Its all about drawing one random number which I will do on Friday, March 2nd, 2012. I will announce the winner in my next blog post. If you care to see my latest designs, here's a sneek peek. 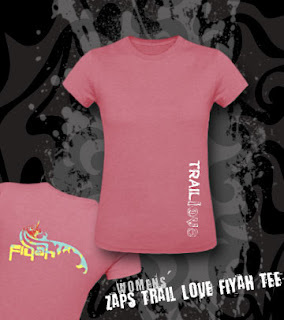 Trail running, ultra running, jump rope ineptitude and well... just plain hard work inspired designs. 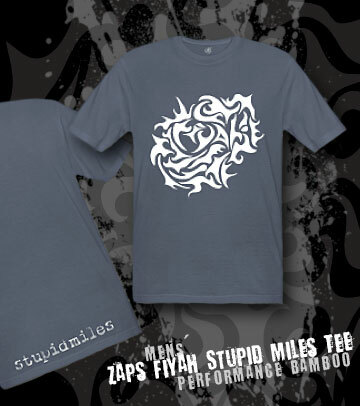 To see the designs in better detail you can visit the Zaps Threads Store, click on the shirt then click on the "design details" link directly below the image. Some of my designs were inspired by specific people and others were suggested. Check it out below. 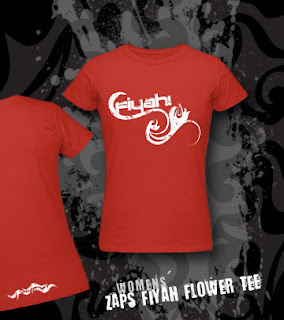 The Fiyah Flower Tee was inspired by my love for henna and the inner beauty of women's strength. 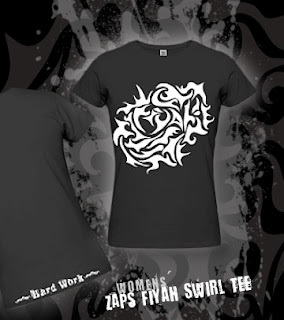 The Fiyah Swirl Hard Work Tee is just straight up badass where we all have to find the fiyah inside to push on. Hard work pays off in more ways than one if you know what I mean. Ha! Check out the placement. 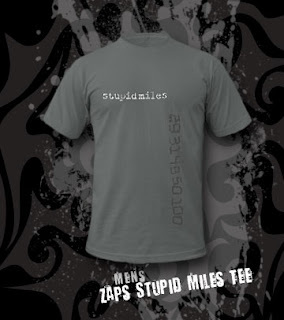 The Fiyah Stupid Miles Tee is inspired by all my runner guy friends (and girl friends) who run, well... stupid miles. Like 120 days of consecutive stupid miles. Or maybe just 120 stupid miles in one day. Numbers like that are stupid big, but pretty badass to say the least. Jason Robillard, Robert Shackleford and Vanessa Rodriguez (along with a few others) came to mind when I think Stupid Miles. I hope they don't take that the wrong way. The Trail Love Fiyah Tee was totally inspired by my running compadre Shelly Robillard (Shoeless Shel Bell) who looks totally hot in pink and rocks the trail fiyah! She's also another Stupid Miles badass. The Jump Rope Fail Tee was Seth Kotelnicki's idea. Actually, I had the "weapons of mass concussion" idea in mind, but I liked this one better. Its the silhouette of a person all tangled up on the floor. Yeah. That was almost me a few times. With my ineptitude I wouldn't put it past me. Maybe its a good thing they got rid of those jump ropes. 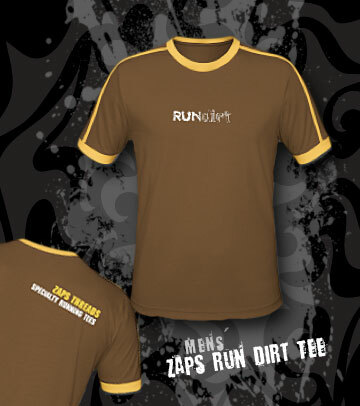 The Run Dirt Tee was inspired by trail running in general. I've always been a fan of trails and still am. I probably always will be. I can't remember if I made this one in a women's version, but I have plans to get one myself. So if you want some, come get some, "like" my shirts and get in on the action. And as always, if you don't win you can always buy a shirt. You can even buy Zaps Tees directly through Facebook in the Zaps FB Store. ( I know... FREE is WAY better.) Some shirt designs will allow you to pick the shirt color of your choice, but others may not due to the limited color selection. If you want a shirt in a particular color, style, or design email me at zapmamak@gmail.com. I will be more than happy to hook you up if I can! And if you don't see a design you like but have a design idea, throw it to me. I'm always open to ideas. I do, however, have the license to design whatever the hell I want (with what limited time I have) so I won't guarantee your idea gets in the store, but if it does I'll definitely give you credit. It's all about the love here. And just so you know... I add a very small commission on all my shirts that gets saved up so that I can do these giveaways. So for every shirt you buy a little money goes back in the pot to do a giveaway. Love the "Run Dirt" design.. that is awesome. I also put several of your shirts on my Amazon "wish list" so my kids know what to get me for Father's day... so considerate right? :-) Anyway, would be so stoked to win a shirt... I'd wear it a lot... for sure :-) Keep those great designs coming! I'll have to agree with Jeff and say that the Run Dirt design is pretty sweet. I also really like the Fail jump rope design. Congrats on the new designs, and I'd love to win me one! Thanks! I think everybody will get what you mean by "stupid miles." The only other option would have been "stoopid miles." Anyway, I love the new designs. 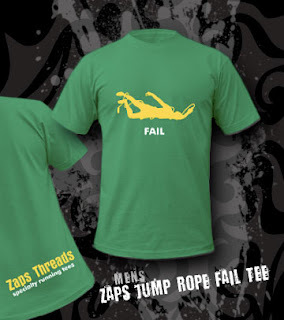 The jump rope fail shirt is hilarious. My fave is still the BFR with the big red foot. A free shirt would be great, but I will be ordering one soon as well. Run Dirt is my favorite as well!! Love all the designs, very nicely done and I hope they do well. GET SOME!! I want a free shirt! Stupid miles are the best kind, right? Yes. They are. Stupid miles rule, man! I want a shirt. I like the jump rope fail one. That would be a hit at CrossFit. LOVE the Stupid Miles and the Run Dirt. Very cool. Would love to win one if I can. Krista, I'd like one of those shirts. My favorite is the "Run Dirt" tee. Thank you! Beer fortress and chickens for me. Dude! If you win, I can totally hook you up with some Run Smiley attire! Allright! I have liked you on the EffBee! Awesome shirts!! A free one would be nice, but I'll probably hit you up with a purchase here soon! I appreciate any artist that has original design, and fortunately I am able to say that I have a friend who is unique in her own way. Just another Runaway Mom. Great new designs, Krista! People still rave about the BFR shirt that I bought from you. Keep up the great work and count me in as a contender for the giveaway! I love all the shirts and would love to wear one!! Sweet shirts Krista. Eyeing off the Run Dirt edition myself. Ohhhh so many to choose from. Excellent work and I would love to win one. Gotta love drunk Kate... Ha! I want A SHIRT!!!!!! PICK ME PICK ME!!! Krista, I've always really liked your design work. How would you feel about tattoo design? Love the fiyah design and stupid miles a lot. Josh - Thanks! I get a lot of people requesting tattoo designs and I have actually designed a few. Funny thing is I would love to learn to tattoo, but none of my friends would let me practice on them. Ha! I love the designs-very cool ideas. I'd love a free shirt to show off! Awesome designs! I want a shirt! Hoping to meet ya on a run soon in Sac soon!!! Terry! So cool to hear from you... Since BRS has been down you can contact me at my email address on my about page. You should totally come run Rodeo Valley (I know its close to AR50) with Pablo and I! We've got quite the crew signed up. They just keep getting better and better. Love it. Having so many problems commenting here. I should get an A for effort! Love the shirts. Can't decide whether flower Fiyah or the Shelly shirt is my favorite. And i really need some cool duds. Been wearing the same boring shirts for soooo long. I sure hope I get picked! Tracy - So glad you were able to comment. I've had some trouble on some other blogger sites so it might be blogger. You definitely get an "A" for effort, girl! Dude! You're in! Just come back this coming Friday (or whenever I said I'd announce the winner, ha!) and see if you won. Throw me some ideas. I'm all open. free t for me! i can even teach you to jump rope, without hitting your head so much. There must be a trick. I'm thinking its when I start to get lazy or something cuz it only happens later in my jumps. Totally weird. I have liked your Facebook page and posted on the wall. I am now exasperated and must drink beer and relax after a trying ordeal. Nice! Thanks for working so hard, David. Enjoy that beer, man! I wouldn't mind a free T-shirt. Yeah, I made it.... anyway - I already like you in SO many ways. The long sleeve trail runner shirt with the elevation map on the back is my favourite. Is it possible to have that on a tech shirt at some point? 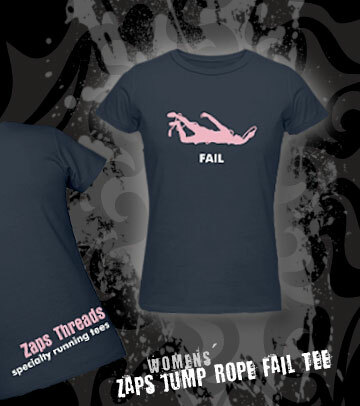 Love love the hard work and jump rope fail shirts!!! Love, kari. Who is too dumb to figure out how to post it with her name and had to post as anonymous. wow...great designs! if i don't win, i'll buy a few. well...even if i win, i'll still buy them :).